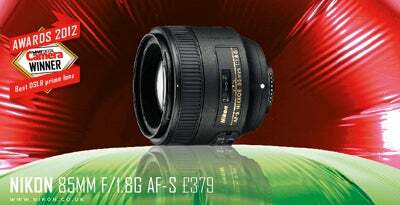 Offering an excellent blend of features and performance at an affordable price, the Nikon 85mm f/1.8G AF-S is our DSLR prime lens of the year. Considerably more affordable than its f/1.4 stablemate that costs almost 4x the amount, this lens delivers an excellent optical performance, with a very good MTF score, with our tests showing it did not dip below the critical 0.25 cycles-per-pixel threshold at any point within the aperture range. Featuring Nikon’s Silent Wave (AF-S) technology for whisper-quiet AF, the lens is well made and sits comfortably on an FX full-frame body, though it’ll be just at home on a DX body for those looking to replicate the popular 135mm focal length on an APS-C DSLR body. The Nikon 85mm f/1.8G is a fantastic lens that delivers excellent results that’d trouble much pricier options.